Have you ever dream to drive a cool fire truck? Here you will drive in the desert city and there are no limits! As you have already understood, there is no one to slow you down and no fire to worry about. You have a great chance to practice your driving skills and become the real hero. 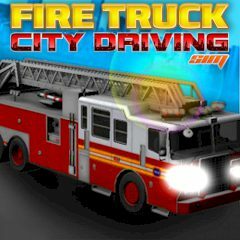 Do not be upset if you crash and wreck your fire truck engine, do not worry a quick reset will have your truck all shiny and new again here. Is everything clear? Then do not waste your time and play this game for free!